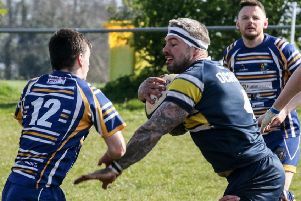 Halifax Vandals coach Jamie Bloem has hailed a “great year” after his side clinched the Yorkshire Four title with a 25-19 success at Hemsworth on Saturday. Vandals, who have never been promoted as champions, have two league fixtures remaining, at home to struggling Sheffield Oaks on Saturday week and then at second placed Wensleydale the following weekend. But with their lead now an unassailable 13 points, Bloem, who is in his third season in charge of the Warley club, was left to reflect on a job well done. “It’s been a great year for the club,” said the former rugby league professional, who confirmed he has agreed to remain with Vandals for at least another two seasons. “It has not been a quick fix; when I came to the club I told them we would work to a three year plan and here we are. “We’re still improving, but we’ve a second team that’s regularly taking 30 players to games so the club’s in good health. “The committee have been really good, they’ve given me whatever I’ve asked for to help the team and that’s been reflected in our results. “It’s hard to pick anyone out on the field, but the forwards have been superb all year. “They’ve regularly been pushing teams off the ball and they’ve scored a lot of tries too. Bloem said his only target for next season, when they will cross swords with Halifax, was Yorkshire Three survival. He reported plenty of interest from potential playing talent. “Next year is about consolidation; we can’t become a yo-yo team,” said Bloem.